One of our primary responsibilities at WeRobotics is to serve as the interface between industry and our growing network of Flying Labs. As such, we serve as an accelerator for our Flying Labs in Africa, Asia, Latin America and Oceana, matching their well-defined needs with appropriate robotics solutions and techniques. We then localize these solutions and techniques through our Flying Labs, after which we promptly get out of the way so they can do what they do best. As such, WeRobotics is not a drone manufacturer. Our mission, rather, is to localize new opportunities for our Flying Labs so that they can tackle the problems that they care about through the responsible use of existing robotics solutions. This explains why our Technology Partners already include DJI, senseFly, Parrot, SkyWatch, OpenROV, ESRI, Pix4D, DroneDeploy and others. Our Flying Labs are already interested in tackling public health challenges related to problems around logistics and supply chains. Our Peru Flying Labs, for example, has worked with BD on field-testing affordable cargo drones in the Amazon Rainforest for a range of medical deliveries. Our Dominican Republic Flying Labs has been field-testing cargo drone deliveries between hospitals and remote clinics. 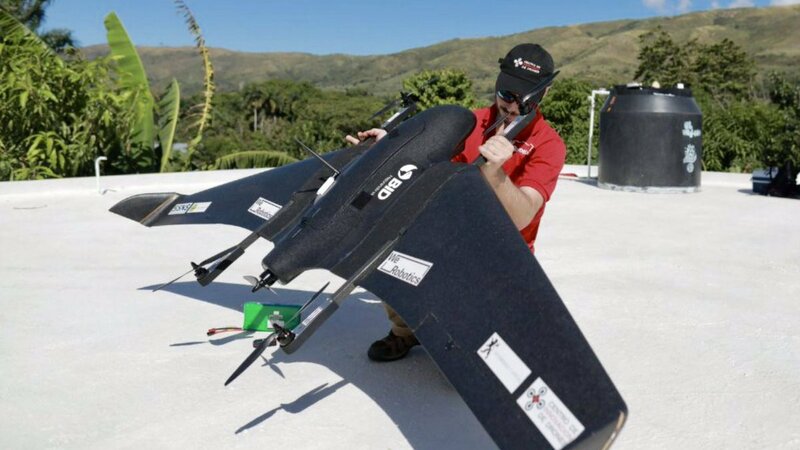 Our Pacific Flying Labs has provided aviation authorities there with demo flights of hybrid cargo drones while our team has carried out cargo drone field-tests in Brazil for Zika reduction. Our collective expertise and learning in this space has prompted further demand from additional Flying Labs and other partners to carry out longer term cargo drone projects that are less focused on testing the technology and more on providing actual services over months rather than weeks. This is exactly what we want to do next as well. In fact, we want to take it one step further by working with our Flying Labs to help incubate local businesses that provide these delivery services over the long term. There’s no reason why cargo drone businesses can only come from the US, Europe or China. We’ve already incubated local drone businesses focused on mapping in both Nepal and Tanzania. We want to do the same for cargo across other Flying Labs. In short, we want to create local jobs and business opportunities in order to have meaningful and sustainable impact. As such, we’re looking to grow our Technology Partnerships to include cargo drone manufacturers whose technologies can be localized through our Flying Labs. We have a number of upcoming cargo drone projects with our Flying Labs in Africa, Asia and Latin America, which are made possible thanks to several high profile partners. So we’re only looking not only for highly reliable cargo drone solutions. We also seek to work with reliable partners who are kind, honest, respectful, mature and culturally intelligent. If that’s you, then we’d really love to hear from you. To learn more about the technical specs that we’re looking for, and to team up with us on these and other projects, please follow this link. Many thanks for your time and interest!